Heat oven to 425°F. In 12-inch skillet, melt butter over medium-low heat. Add onions and cook 30 to 35 minutes, stirring frequently, until golden brown. Stir in salt and pepper; set aside. Line cookie sheet with cooking parchment paper. Remove pie crust from pouch; unroll on lightly floured surface. Roll to 14-inch round. Transfer to cookie sheet. Spread three-fourths of the caramelized onions over crust, leaving 4-inch border around edge. In medium bowl, toss pears with flour. 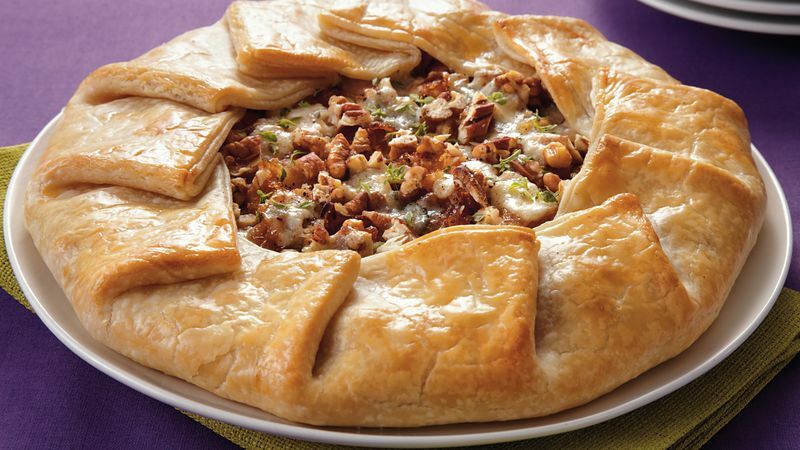 Arrange pears over onions; top with remaining onions, the pecans, cheese and thyme. Fold 4-inch borders of dough over filling, pressing gently to seal. Brush dough with beaten egg. Bake 24 to 25 minutes or until golden. Cover with foil if necessary to prevent excessive browning. Cool on cookie sheet on cooling rack 5 minutes. Garnish with thyme leaves. Serve warm or at room temperature.